Applicants must be able to work alone, stay on task, be self-motivating, have a strong work ethic, take pride in accomplishment. 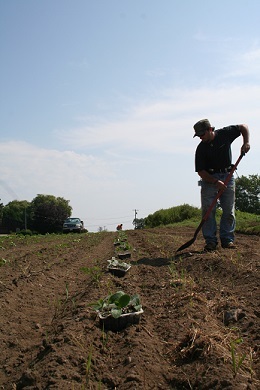 The job will evolve over the course of the summer, many days will be filled with weeding, there will also be harvesting and planting opportunities. - Weeding: includes by hand as well as with tools, standing in field for long periods of time in the sun, often on hands and knees, killing weeds and encouraging the vegetables to grow. - Harvesting: working alone and/or with others at times to select quality ready for dinner vegetables! - Planting: working alone and/or with others to transplant seedlings to the fields, both by hand as well as with a tractor and planter devices. Flexible Hours: We are willing to work with you on scheduling. Minimum 20 hours per week will be offered, at the height of the season more will be available. Minimum Wage Offered.